After a year and a half of impatient waiting, 1112 episode 02 has finally hit the App Store. Thanks to a brief synopsis, you don’t need to have played episode 01 to understand what is going on, and new and old fans alike will find a lot to enjoy in this dark and stylish point-and-click thriller. Louis Everett, a New Jersey antiques dealer and a dead ringer for Johnny Depp in The Ninth Gate, has woken up in a posh New York hotel with no memory of how or why he is there. The rest of the game has you helping Louis uncover some of the complicated and confusing mystery that is surrounding him. There are puzzles galore in the game, and a large and colorful cast help inject a lot of character into the moody urban settings. You can also interact with just about everything you see, often with amusingly witty results. From the very start, I was struck by the game’s elegant artistry. The design takes its cues from comic books, but think dark graphic novels instead of schlocky superhero covers. The characters are all gorgeously realized, and the writing does a marvelous job of fleshing out their individual personalities. Louis, in particular, is a master of the witty aside, a fact which makes the grind of examining mundane items much more enjoyable than you’d think. There are quite a few typos and translation issues, but not so many as to completely derail the game. I was actually impressed by how much humor they managed to preserve across the language barriers. The touch controls are not quite as slick as the visuals, sadly. Several of the puzzles become a frustrating ordeal because of sensitivity issues, and more than once I would be stabbing at the screen in vain. The puzzles also didn’t quite dazzle me the way I was hoping. Some of them were excellent, but some of them just seemed unmotivated, and I downright hated the magically tightening screws toward the end. Those of you who dislike or aren’t familiar with sudoku may also despise the latter half of the game. There are no hints or options to skip puzzles, so getting stuck is definitely a possibility, but that’s why we love online walkthroughs, no? 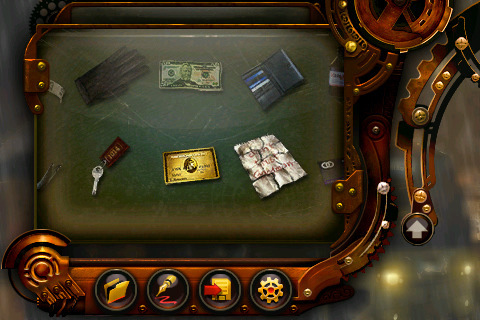 Item combination is a big part of most point-and-click games, and 1112 is no exception. Some of the combinations are very clever, but occasionally you’ll run into a headscratcher, and finding key objects can also be very difficult sometimes. I did like the inventory interface though, as it was clean, intuitive, and very easy to use. I’m a huge fan of point-and-click adventure games, so in general, I really liked 1112 episode 02, although there are some noticeable flaws, but fans of the genre will be pleased with this game. It handles a little rough, but it looks incredible, and it has an interesting story and characters. I’m not wild about cliffhanger endings, but I’ll admit that it is keeping me eager for episode 3. I just hope that it won’t take another year and half for the next installment to come out. AppSafari review of 1112 episode 02 was written by Tracy Yonemoto on May 11th, 2010 and categorized under Adventure, App Store, Featured, Games. Page viewed 4284 times, 3 so far today. Need help on using these apps? Please read the Help Page.